We accepted the invitation to test a bike with features not exclusively trial-oriented , because we were intrigued by knowing as a model born for mountaineering tour, can find room in the era of Mulatrials , which are experiencing a golden moment . 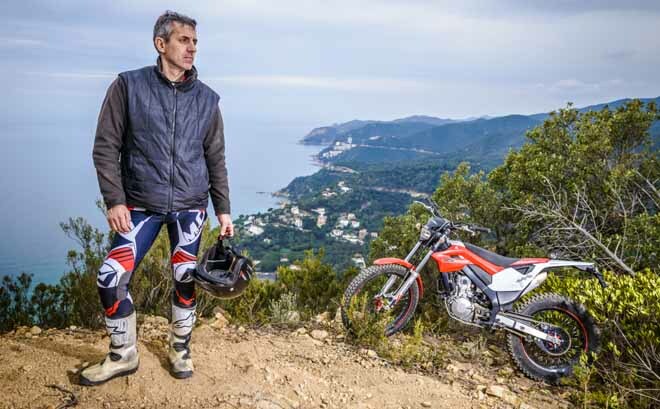 The new Montesa 4RIDE was unveiled at last November in Milan’s exhibition and our tester , Alessio Sarafini , about two weeks ago, has largely been able to ride it near San Felieu de Guixols , in Costa Brava , where it was officially made available to journalists of the motorcycle environment , with a shift to the Enduro world , for a long ride accompanied by former world rider Amos Bilbao. It is in this segment that the bike should carve out its spaces: a segment between Trial and Enduro, composed of all fans who love the trips on dirt roads, paths or mule trails, with a relatively comfortable bike, with minimal effort and maximum reliability for the mechanical part. In the 70s and 80s it was customary for the factories that dominated the market at the time, in parallel with specific models for Trial, to produce even same models with larger tanks, more comfortable seats, a wider gear ratios, which were called for mountaineering tour. And it was actually mountaineering tour, because it was still allowed to ride on paths and mule tracks so, especially the Alps represented a wonderful resource for this kind of market. Those were the days of Ossa Explorer, Bultaco Alpina or Montesa King Scorpion. But with the progress of off-road riding restrictions, these specific motorcycles disappeared from the market. For years we have seen timid attempts to come up beside Trial specific bikes, some bikes addressed to an audience more touristy, but these mountain users were soon discouraged for the risks of fines and moto-seizures. 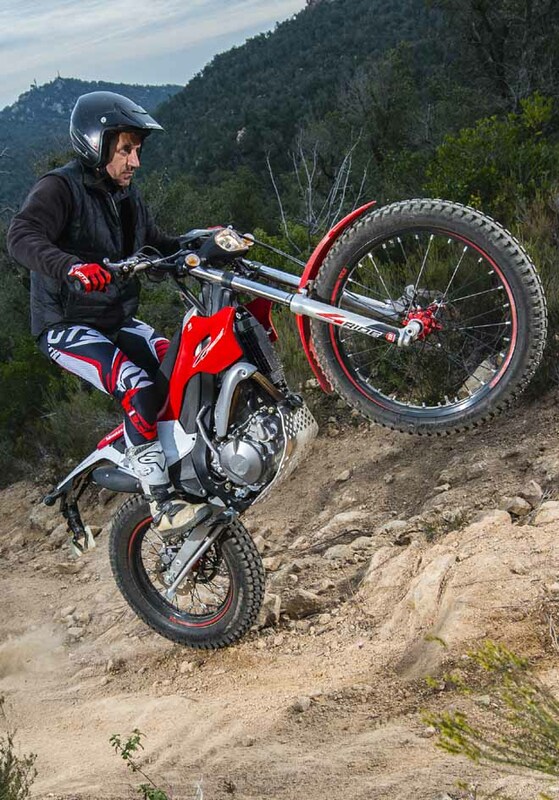 (Italian experiences) Now that the phenomenon Mulatrial, Italian product, is literally exploding, has more than ever sense that they proposed a suitable bikes to these events, always hoping to have legislation regulating the off-roaders less invasive than it is today. 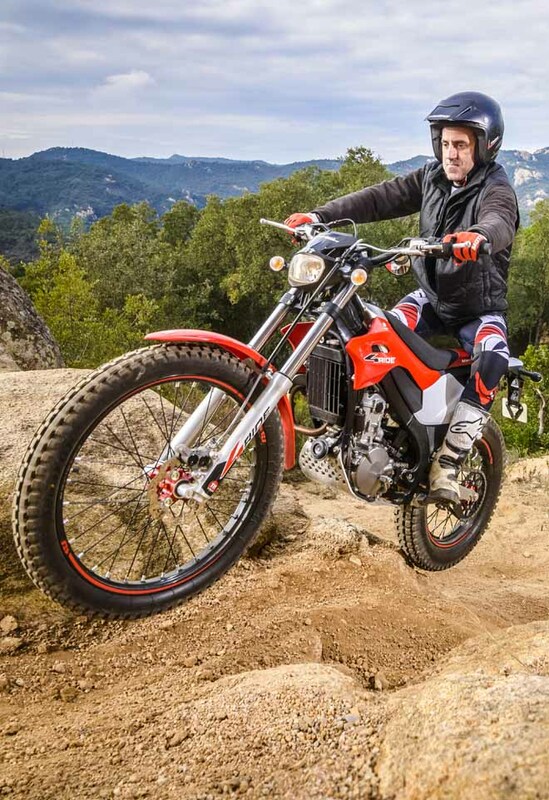 The 4RIDE comes from the Cota4RT260, that generated a real revolution in the world of Trial, being able to offer a completely new 4 stroke engine, with 4 valves and PGM-FI electronic fuel injection, able to compete at the highest level with rivals using the lightest and simplest 2 strokes. The "4" - in addition to remember that this is a 4 stroke - was meant to emphasize the flexibility for which it was made, namely the desire to launch a versatile bike, suitable from home, use on the road and venture out on the preferred trails . In practice 4 objectives: adventure, fun, freedom and flexibility. As for the sisters Cota260 4RT, Race Replica and Cota 300RR Race Replica , the 4RIDE is built in modern plants in Santa Perpetua de Mogoda, Barcelona. 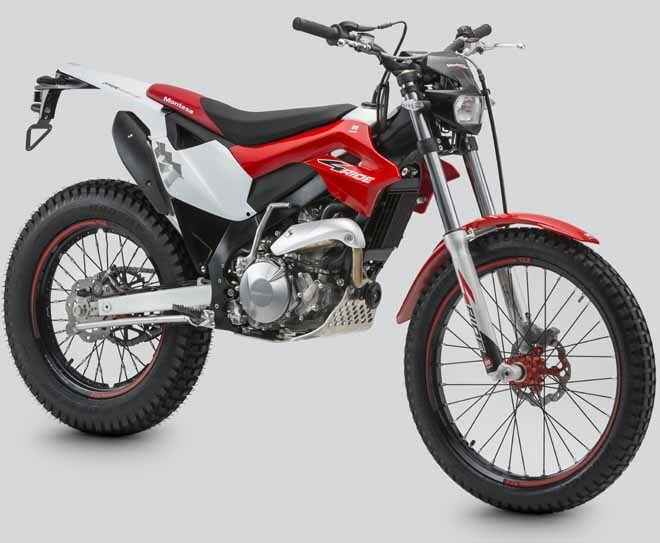 The “red” Montesa is the predominant color of the new 4RIDE. Is present on the front mudguard, side covers and the rear of the seat (combined with black), as well as on the wheel hubs and decals. The 4RIDE logo is shown in black and white, next to Montesa’s logo, both featured on the sides of the motorcycle and the fork tubes, with the slight variation of the "4" in red. 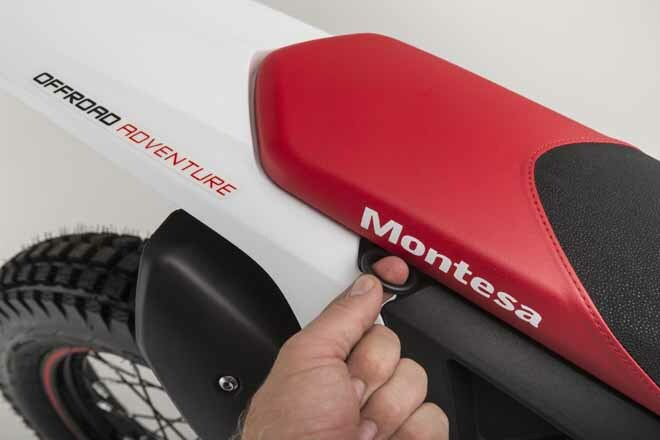 This red color is combined with the white plastic rear mudguard, where we find the "M" Montesa’s logo in grey with the slogan "Off-road adventure" which clearly defines the orientation of this new Montesa. The aluminium fuel tank is not covered by plastic. 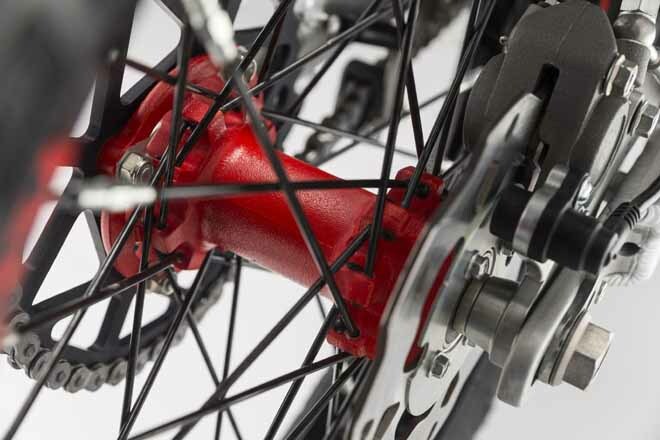 The hubs, red in color, combine with black wheel rims and spokes, giving 4RIDE a sporty appearance and attractive. The handlebar is also black. Frame and swingarm are made of aluminium. Particular attention was given to ergonomics (the seat is a 880mm high), to get more comfort and ease of riding in line with its "adventure” orientation - The footpegs are larger. the capacity of the tank Increased, from 1.9 litres of trial model to 4.4 litres of this model, which means a range of about 120 kilometres. Under the seat, easily removable by hand without the need for tools, there is a large storage space where a light jacket, gloves and any other useful object may be stored. The adjustable fork TECH is now 38 mm longer and has 24 mm more travel. Modified the rear suspension, the multi-adjustable R16V is now 12 mm higher. The brakes are from Braktec. The front train has a 4-piston monoblock caliper. 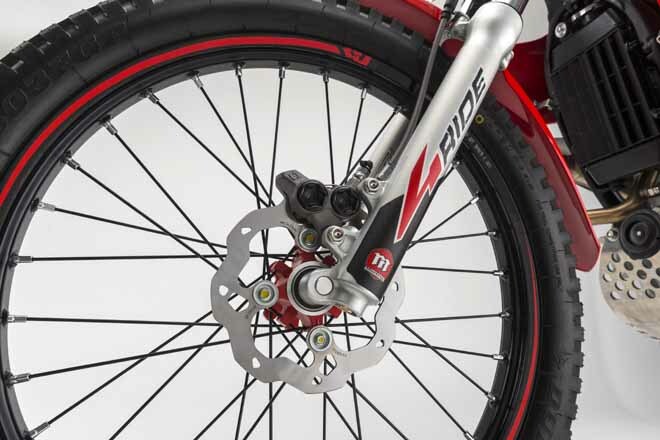 The rear brake disc diameter has been increased from 150 to 180 mm. As tires the new Dunlop D803GP were chosen. The kerb weight declared is only 85 kg. Tha 4RIDE engine maintains the 258,9 cc 4T of Cota 4RT 260 and Race Replica. The novelty than its trial counterparts is in gear ratio: on the 4RIDE the five gears have a longer gear ratio. 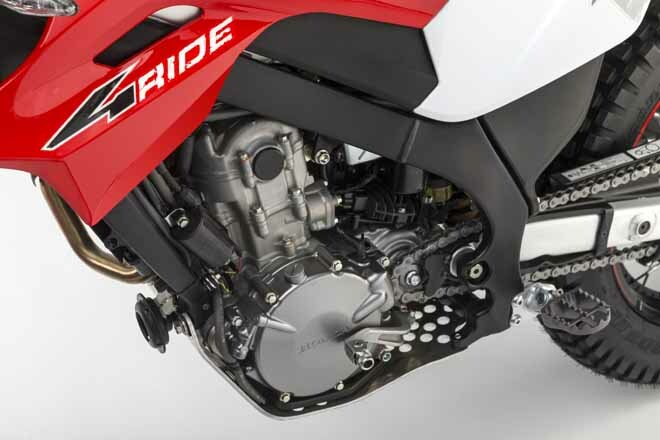 Also there is an exhaust of bigger volume, larger and longer than the Cota 4RT’s one, to give a smoother and less aggressive response to the opening of the throttle, relative to a trials bike. The kick starter lever is longer to make starting easier. The fuel pump is the same as Race Replica, as well as Cota 260 and also the gas decompressing system in the crankcase that reduces engine braking when closing the throttle, giving the rider the feeling of lightness and ease of control. To kick-off is very easy, thanks to the rather long lever, assuming that we have the important foresight not to open the throttle. The rumble is pleasing and moderate, certainly its decibels can compete with the sounds of nature, like a mountain stream and it can pass almost on the sly, folding walkers non motorized, if them of large views, of course. But the excursion of our test was done in Spain in a winter weekday, so we had no way to make meetings. Having our tester some experience in Enduro riding too, we tried to identify ourselves for a moment as enthusiast riders of that specialty. 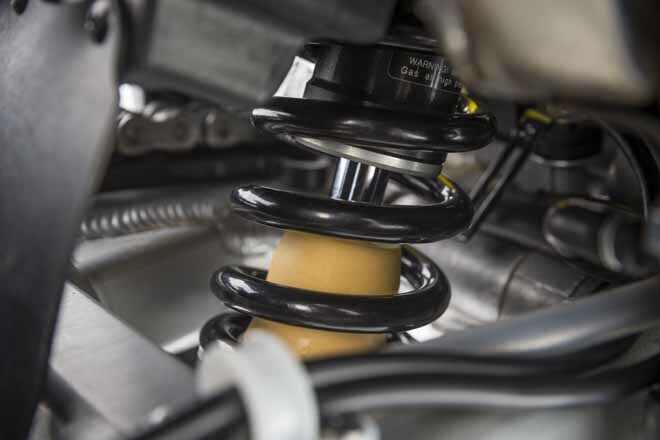 What emerges in relation to an Enduro “sister” is a certain thinness and lightness, combined with an engine equipped with a strong torque, it easily allows everybody to take their first steps onto an off-road vehicle. Those ones who were already more experience, could try more demanding mule tracks, trying to ride it standing up on the footrests, trial style, and refine their style guide, enriching it with the virtuosity of “tightrope walkers” of motorcycles, as trialmen are sometimes defined. On the contrary, testing the bike with a Trial eye, we are immediately tempted to look for its limits on typical obstacles of this specialty, because the Mulatrial often offer a "hard" track where there are opportunities to enforce the riding experience of those’s are already at good level. Well, as you can see from the pictures, the 4RIDE does not seem to suffer the extra pounds respect the Trial version sisters. Especially thinking that the more weight is due to a tank that relieves the user from the risks of transporting gas in jerry cans or even plastic bottles in his backpack. Or due to having a seat that, when the trail gives way to a fast dirt track or even a stretch of asphalted road, is truly appreciated. The seating position has nothing to do with the traditional extreme Trial bikes, here the decidedly highest seat allows for a secure, comfortable sitting guide. Even the extra gear or jacket can be fitted in a large compartment under the seat, accessible without using tool keys. In short, combined with a 4-stroke engine able to compete in performances with the most advanced 2 stroke’s in the world of Trial, we can only see enhanced skills in the use of mountain tourism. A good compromise for those ones who want to consider the motorcycle riding from the standpoint of relaxation and will not suffer to accommodate the tour choice, or too powerful engines with frames with geometries that do not bend easily or motorcycles too spindly and uncomfortable because with little autonomy and totally devoid of seat. But then we found only advantages? No there is a big problem. The risk that this hypothetical market segment to be placed among the Enduro and Trial do not have sufficient numbers to justify this investment. Because especially in the Trial, the tendency is to buy the latest models used in competitions at the highest level and then adapt them to use quieter with the adaptations mentioned before. 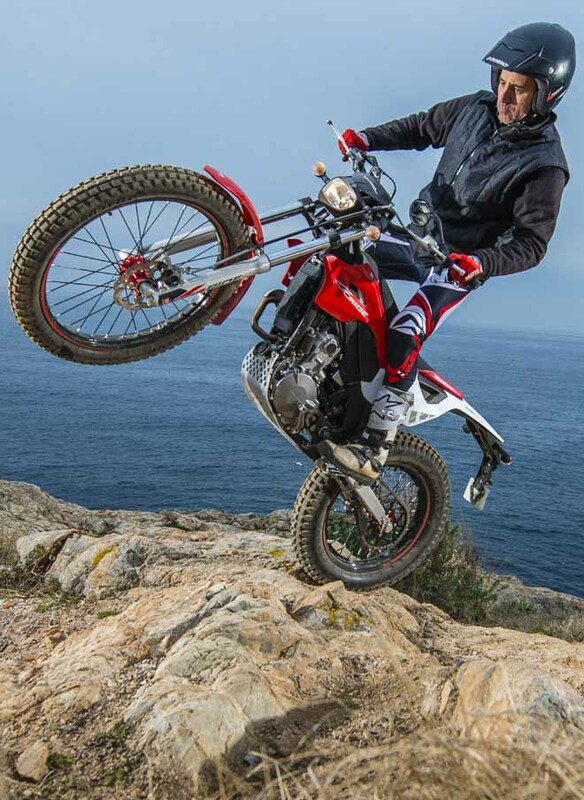 But Montesa’s men definitely probed the market before this launch and the promotional video that you can see, show how they are willing to address this campaign out of the Trial world, in order to approach to a wider audience. Abbiamo accettato l'invito di provare una moto dalle caratteristiche non esclusivamente trialistiche, perchè ci ha incuriosito sapere come un mezzo nato per il motoalpinismo, possa collocarsi nell'era delle Mulatrial, che in Italia stanno vivendo un momento d'oro. 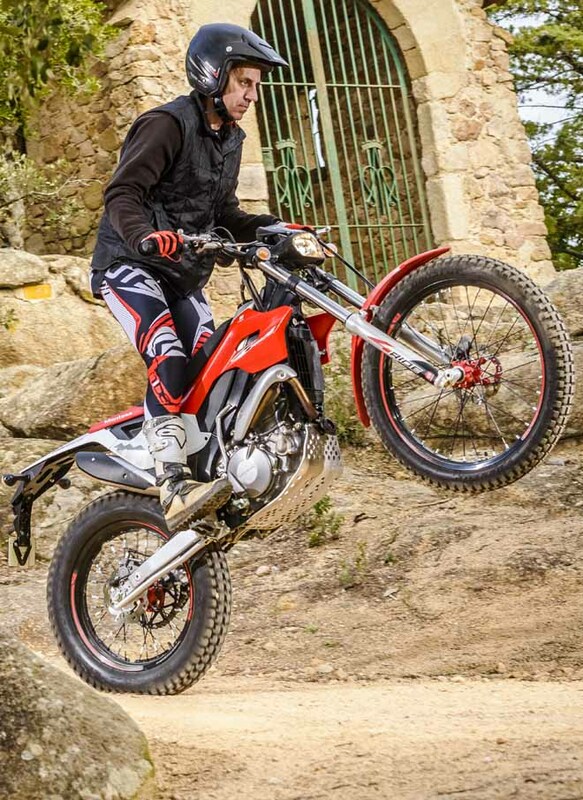 La nuova Montesa 4RIDE è stata presentata al Salone di Milano lo scorso novembre ed il nostro tester, Alessio Sarafini, circa 2 settimane fa, ha potuto abbondantemente provarla nei pressi di San Felieu de Guixols, in Costa Brava, dove è stata ufficialmente messa a disposizione di giornalisti del settore motociclistico, con un orientamento maggiore al mondo dell'Enduro, per un lungo giro accompagnati dall'ex-pilota mondiale Amos Bilbao. Ed è proprio in questo segmento che la moto dovrebbe ritagliarsi i suoi spazi: un segmento a metà fra il Trial e l'Enduro , composto da tutti gli appassionati che amano le gite su sterrati, sentieri o mulattiere, con un mezzo relativamente comodo, con il minimo di fatica e con il massimo dell'affidabilità per la parte meccanica. Negli anni 70, 80 era consuetudine per la Case che dominavano il mercato dell'epoca, parallelamente ai modelli specifici per il Trial, “uscire” anche con modelli provvisti di serbatoi maggiorati, selle più comode, rapporti cambio un po' più lunghi, che venivano chiamati da motoalpinismo. E di motoalpinismo si trattava realmente, perchè non essendoci ancora i divieti che oggi ben conosciamo, i sentieri e le mulattiere delle nostre catene montuose, in particolar modo le Alpi, rappresentavano una ghiotta risorsa. Erano i tempi delle Ossa Explorer, dei Bultaco Alpina o delle Montesa King Scorpion. Ma con il progredire dei divieti di circolazione fuoristrada, questi mezzi specifici non hanno più avuto mercato. Così per anni si è assistito a timidi tentativi di affiancare il mezzo nato specificatamente per il Trial a quello per un'utenza più turistica, che però si stava sempre più assottigliando, scoraggiata dai pericoli di multe e sequestri di moto. Ora che il fenomeno Mulatrial , prodotto del tutto italiano, sta letteralmente esplodendo, ha più che mai senso che vengano riproposti mezzi adatti a questi eventi, sempre nella speranza di una legislazione che disciplini il fuoristrada meno invasiva di quanto lo sia oggi. 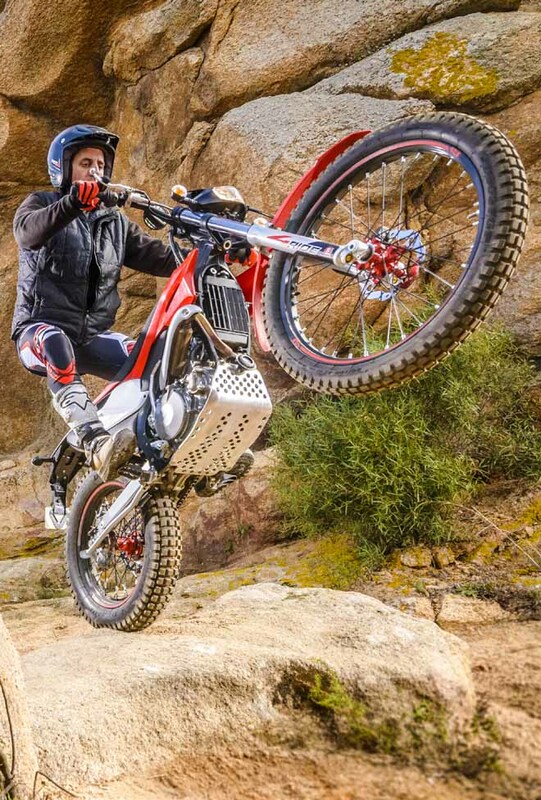 La 4RIDE deriva dal modello Trial Cota4RT260 , quella che ha generato una vera rivoluzione nel mondo del Trial , riuscendo ad offrire un motore completamente nuovo a 4 tempi, con distribuzione a 4 valvole e alimentazione a iniezione elettronica PGM-FI, in grado di competere ai massimi livelli con una concorrenza che utilizza i più leggeri e semplici 2 tempi. Il “4” oltre a ricordare che si tratta di un 4 tempi, è stato pensato per sottolineare la duttilità per cui è stata costruita, cioè il voler lanciare un mezzo polivalente, adatto a partire da casa, circolare su strada ed avventurarsi sui sentieri preferiti. In pratica 4 obiettivi : avventura, divertimento, libertà e versatilità. Come per le sorelle Cota 4RT 260, Cota Race Replica e Cota 300RR, anche le 4RIDE sono costruite nei moderni stabilimenti di Santa Perpetua de Mogoda, Barcellona. 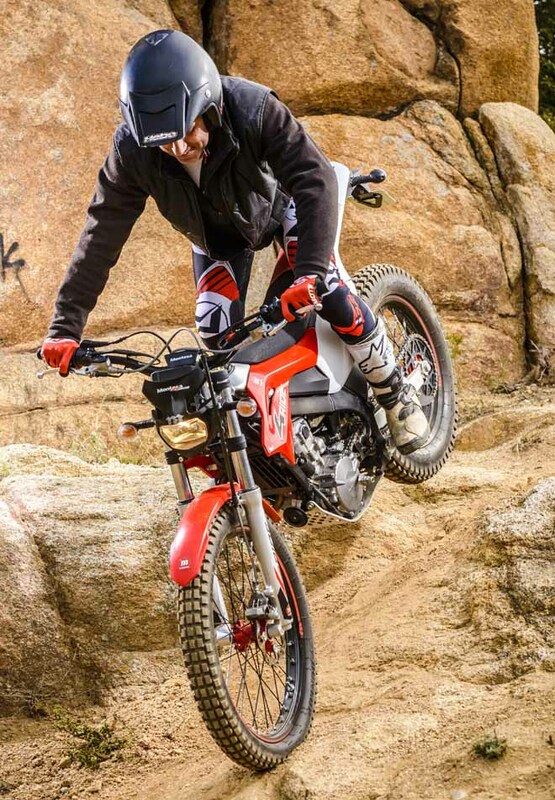 Il rosso Montesa è il colore predominante della nuova 4RIDE. È presente sul parafango anteriore, sulle fiancatine laterali e sulla parte posteriore della sella (combinato col nero), inoltre sono rossi i mozzi ruota e gli adesivi sui cerchi. Il logo 4RIDE appare in bianco e nero, unito al logo Montesa, su ambo i lati della moto e sui foderi della forcella, in questo caso con il numero “4” in rosso. 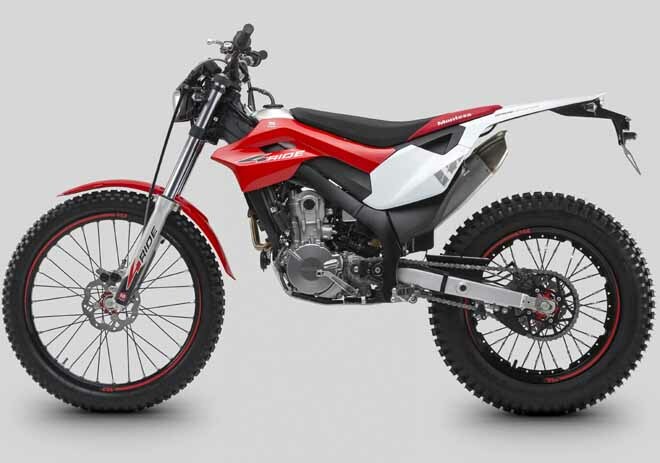 Questo color rosso si combina con il bianco del parafango posteriore in plastica, dove troviamo integrata la “M” del logo Montesa in grigio con il logo “Offroad adventure” che definisce chiaramente l’orientamento di questa nuova Montesa. Il serbatoio del carburante in alluminio non è coperto da plastica. I mozzi, di colore rosso, si combinano con il nero dei cerchi e dei raggi, dando alla 4RIDE un aspetto sportivo ed accattivante, anche grazie al manubrio,a sua volta nero. Telaio e forcellone sono in alluminio. Particolare attenzione è stata data all'ergonomia (la sella è a 880mm di altezza), per ottenere un maggiore comfort e facilità di guida in linea con il suo orientamento “adventure”. Le pedane poggiapiedi sono maggiorate in larghezza. Aumentata la capacità del serbatoio, da 1,9 litri del modello da trial ai 4,4 litri di questo modello, che significa un’autonomia di circa 120 chilometri. Sotto la sella, facilmente removibile a mano senza necessità di utensili, si trova un importante spazio di carico dove è possibile inserire, ad esempio, una giacca leggera, guanti e qualsiasi altro oggetto che possa essere utile durante un’escursione. La forcella TECH regolabile è ora 38mm più lunga e dispone di 24mm in più di escursione. La sospensione posteriore R16V, anch’essa pluri-regolabile, è ora più alta di 12mm. I freni sono della Braktec. L’avantreno ha una pinza monoblocco a 4 pistoncini. Il disco freno posteriore è stato maggiorato, da 150 a 180mm. Come gomme sono stati scelti le nuove Dunlop D803GP. Il peso in ordine di marcia dichiarato è di soli 85 kg. Il Motore della 4RIDE mantiene come base il 258,9cc 4T delle Cota 4RT 260 e Race Replica. La novità rispetto ai modelli da trial si trova nel rapporto del cambio, sulla 4RIDE le cinque marce hanno un rapporto più lungo. Inoltre c'è uno scarico di maggiore volume, più grande e più lungo rispetto a quello della Cota 4RT, per dare una risposta più fluida e meno aggressiva all’apertura del gas rispetto ad una moto da trial. Anche il pedale della messa in moto è più lungo per facilitare l’avviamento. La pompa benzina è la stessa delle Cota 260 e Race Replica, come anche il sistema di decompressione nel carter che permette di ridurre il freno motore alla chiusura del gas, dando al pilota quella sensazione di leggerezza e facilità di controllo. Mettere in moto è molto facile, grazie alla leva piuttosto lunga, ammesso che si abbia l'importante accortezza di non accelerare. Il rombo è piacevole e contenuto, sicuramente di quelli che come decibel possono concorrere con i rumori della natura, come un torrente di montagna e passare quasi alla chetichella incrociando escursionisti non motorizzati, se di vedute ampie e non talebane, ovviamente. Ma l'escursione della nostra prova è stata fatta in Spagna in un giorno invernale feriale, quindi non abbiamo avuto modo di fare incontri. Avendo il nostro tester anche una discreta esperienza enduristica, abbiamo provato ad immedesimarsi per un attimo in un pilota o appassionato di quella specialità. Quello che emerge rispetto ad una sorella da Enduro, è una certa esilità e leggerezza, che unite ad un motore dotato di una forte coppia permettono facilmente di muovere i primi passi nel fuoristrada a chiunque. Chi invece fosse già più esperto, può tentare senza pericolo escursioni più impegnative, provando a guidarla il piedi con stile trialistico e quindi raffinare la sua guida, arricchendola con i virtuosismi dei funamboli delle motociclette, come alle volte i trialisti vengono definiti. Provando la moto invece con occhio trialistico, si è subito tentati a cercarne i limiti sugli ostacoli tipici della specialità, anche perchè le Mulatrial offrono spesso un percorso “hard” dove non mancano le occasioni per far valere l'esperienza di guida di chi il Trial già lo mastica. Beh, come si può vedere dalle foto, la 4RIDE non sembra patire i chili in più delle sorelle versione Trial. Soprattutto in considerazione che il maggiore peso è dovuto ad un serbatoio che solleva l'utente dai rischi di trasportare la benzina in taniche o addirittura bottigliette di plastica nello zaino. O di una sella che, quando il sentiero lascia il posto ad un veloce sterrato od anche un tratto di strada asfaltata, viene veramente apprezzata. La posizione da seduti non ha niente a che fare con quella tradizionale delle moto estreme da Trial, ossia ginocchia in bocca, qui la sella più alta permette una guida seduti decisamente comoda e sicura. Anche gli attrezzi o una giacca supplementare possono trovare posto in un ampio vano sotto la sella, accessibile senza utilizzare chiavi. Insomma unito ad una parte ciclistica il motore 4 tempi che compete come prestazioni ai 2 tempi più evoluti del mondo del Trial, non può che vederne esaltate le doti nell'impiego turistico-escursionistico. Un giusto compromesso per chi voglia considerare il giro in moto dal punto di vista di momento di relax e non voglia soffrire per adattare alla gita scelta, o motori troppo potenti con telai con geometrie che non permettono di curvare facilmente o motociclette troppo esili e scomode perchè con poca autonomia e totalmente sprovviste di sella. Ma quindi solo pregi abbiamo trovato? No il problema c'è. E' il rischio che questo segmento ipotetico di mercato da porsi fra l'Enduro ed il Trial non abbia numeri sufficienti per giustificare questo investimento c'è. Perchè specie nel Trial, la tendenza è di acquistare gli ultimi modelli usati nelle competizioni ai massimi livelli, salvo poi adattarli ad un uso più tranquillo con gli adattamenti accennati prima. Ma la Montesa ha sicuramente sondato il mercato prima di questo lancio ed anche il video di promozione che potete vedere, fa intendere di voler uscire dal mondo del Trial ed approcciarsi ad un utenza più vasta.